When I write songs I see them as movies with myself as the actor and director," says Epic/Cleveland International recording artist Jim Steinman. As the writer and arranger of Meat Loaf's Bat Out Of Hell LP, Steinman established his mastery of the spectacular rock production style that he takes even further on his own debut solo album, Bad For Good. With the help of E Street Band stalwarts Roy Bittan (piano) and Max Weinberg (drums) and Utopia bassist Kasim Sultan, Steinman has created a Technicolor sound canvas that sounds like, as he puts it, "God hit the world and the world hit back." 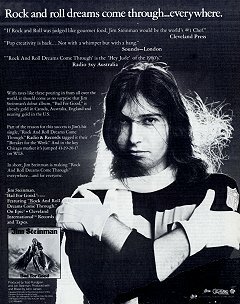 Steinman admits that he originally conceived the album as a sequel to Bat Out Of Hell, but after Meat Loaf made several unsuccessful attempts to record his vocals and asked Steinman to write him and entirely different album, Steinman decided to use the Bad For Good material for himself. He worked on Bad For Good from August 1980 to March of this year. "Making this album was a liberating experience for me," he says, "because it made me realize that I could continue to write for Meat Loaf and do my own albums as well. With this record, I saw myself not just as a singer but being ringmaster of a circus" - the album includes featured vocal contributions by "Bat" veterans Karla DeVito, Ellen Foley and Rory Dodd, who sings lead vocals on Surf's Up and Lost Boys And Golden Girls. In line with his cinematic fixation, Steinman is working several of the album's songs into film projects. Love And Death And An American Guitar, based on a monologue Steinman used to do on Meat Loaf shows, is being developed into a film called Guitar, which tells of the 1954-1956 experiences of the first Fender Telecaster. Stark Raving Love is being developed into a CBS-TV movie that Steinman describes as "an updated West Side Story". Lost Boys And Golden Girls is the basis for Neverland, which Steinman says is "a rock 'n' roll science fiction version of Peter Pan that takes place in a city built on the ruins of Los Angeles after a series of chemical wars." Steinman came by his theatrical and musical leanings early, playing rock and classical piano while growing up in New York and California. He wrote the book, music, and lyrics for his first play, The Dream Engine, while in college. His next project was the play More Than You Deserve, which premiered in 1974 and led to his first meeting with Meat Loaf, who auditioned for a part in it. After a short tour with The National Lampoon Road Show, the two began working on Bat Out Of Hell. Steinman also wrote an orchestral film score for A Small Circle Of Friends in 1980. Steinman's current projects include the writing, arranging and co-production (with Jimmy Iovine) of Meat Loaf's forthcoming album, as well as developing material for Karla DeVito and Rory Dodd. He also plans to do either a late summer tour with Meat Loaf or a tour of his own. "With this album I really tried to top Bat Out Of Hell and go as far as I could in this musical style," Steinman explains.